TOKYO - Japan's central bank expanded its asset purchases in a surprise move Friday to shore up sagging growth in the world's No. 3 economy. The Bank of Japan said it would increase its purchases of government bonds and other assets by between 10 trillion yen and 20 trillion yen ($91 billion to $181 billion) to about 80 trillion yen ($725 billion) in total annually. BOJ Gov. Haruhiko Kuroda said the increase was required to prevent a reversal into a "deflationary mindset" that the country's leaders contend has stymied growth for many years. 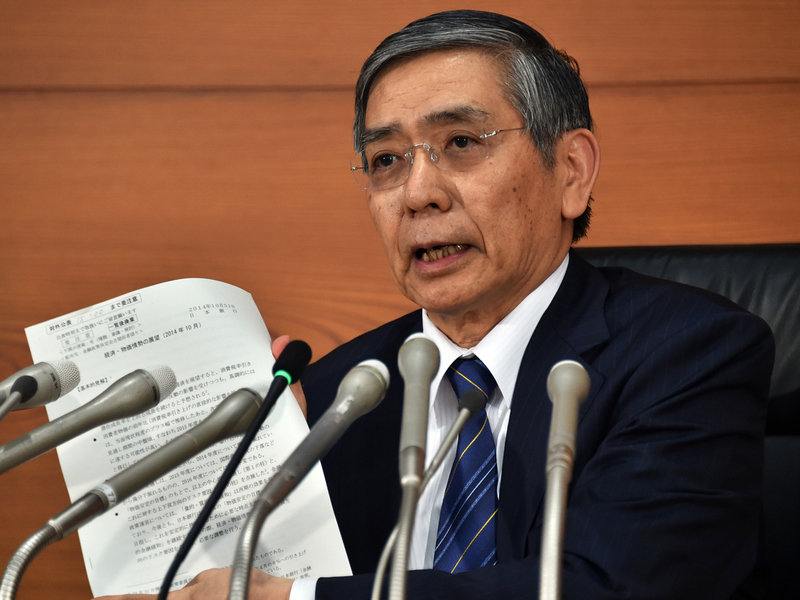 Countering such a trend is "the most important thing we can do," Kuroda said. "Whatever we can do, we will." The Nikkei 225 stock index jumped 4.8 percent to close at a seven-year high of 16,413.76 and the dollar rose 2 percent against the yen after the unexpected decision. Data released Friday, as the BOJ was holding a routine policy meeting, showed Japan's economic recovery remained in the doldrums in September as household spending fell, inflation edged lower and unemployment ticked up. The central bank's announcement highlights divergent fortunes among major economies. The U.S. Federal Reserve earlier this week announced it was ending its own extraordinary program of asset purchases, known as quantitative easing, which it instituted after the global recession to help the U.S. economy recover. As that $4 trillion program wound down, Japan's central bank has come under pressure to increase stimulus to support growth as Prime Minister Shinzo Abe weighs approval of another sales tax hike next year. The central bank's decision may encourage Abe to push ahead with the politically difficult choice. Surveys show more than 70 percent of the public are opposed to raising the tax, which is needed to help tame Japan's swollen government debt. A sales tax hike in April, from 5 percent to 8 percent, slowed the recovery that began in late 2012. Abe is due to decide before the end of this year whether to raise the sales tax by another 2 percentage points to 10 percent. He also is expected to introduce supplementary spending to cushion the impact of the tax hikes. The central bank said the monetary loosening would continue as long as needed to attain an inflation target of 2 percent. In addition to stepping up asset purchases, it also will triple its purchases of exchange-traded funds and real estate investment trusts, and increase the average maturity of the assets it holds to 10 years from seven years. The bank's main decisions on expanding the scope of monetary easing passed by a 5-4 majority, indicating differences of opinion among members of the bank's policy board. The central bank's announcement caught most analysts by surprise. "We had expected the bank to announce additional stimulus only in 2015," Marcel Thieliant, an economist with Capital Economics, said in a commentary. After an initial burst of surging stock prices last year, most people say they haven't benefited directly from that "Abenomics" strategy. Despite some wage increases, incomes have fallen overall as prices have risen. And Abe has made scant progress on reforms intended to open new opportunities and improve competitiveness. Unemployment rose to 3.6 percent from 3.5 percent. The government reported that household spending fell 5.6 percent from a year earlier in September, though it rose 1.5 percent from August. Household incomes, meanwhile, fell by 6 percent from a year earlier in real terms. Kuroda cited high uncertainty over wage and spending trends as a factor clouding the economic outlook.